The locations where you’re most likely to be a victim of a ‘crash for cash’ scam have been revealed by the Insurance Fraud Bureau (IFB). But what are these scams and how can you protect yourself? A ‘crash for cash’ scam is when somebody stages a car accident. Their aim is to make a fraudulent or exaggerated insurance claim in the hope of making a quick buck. They might drive badly to force a collision, pull in front and quickly brake, or hit the brakes unexpectedly at any time. They might even flash you out at a junction then speed up to hit you. Commonly they will then claim for personal injury, particularly whiplash. They might also claim loss of earnings or damage to personal possessions. They hope the insurance company will pay out, with innocent drivers footing the bill through higher premiums. In recent years these claims have been a growing problem. It’s reckoned there is around 30,000 claims each year costing an estimated £340million – or £50 to each of us. Scammers choose victims wisely, looking for those who won’t argue their case. Those at risk include women with children in the car and elderly drivers. Insurance firms are understandably keen to crack down on this sort of scam. Not only are they refusing to payout where fraud is suspected, they’re claiming back legal costs from lying drivers. They’re also campaigning to reduce the cap for compensation payouts, making scams much less lucrative. Claims are carefully reviewed for any sign of fraud and investigated carefully. Aviva alone dealt with 16,000 suspicious claims last year and now rejects one in 10 whiplash claims. However, as a driver there’s plenty you can and should be doing to protect yourself. In a word, proof! Scammers are reliant on innocent drivers not being able to prove what happened. They’re also reliant on the assumption that the driver behind should leave space to stop no matter what, making any accident their fault. Dash cam footage in invaluable, proving what actually happened. But there’s plenty more evidence you should gather for your insurer including pictures and witness details. Scammers might try and prevent you doing this or intimidate you. Do not admit liability or challenge them on your suspicions. After an impact 4Sight sends footage to an advisor who’ll call you straight away. If you’re feeling intimidated or scared, they will call emergency services on your behalf. The app also walks you through all the evidence you need, leaving nothing behind and keeping you keep cool. If you suspect you’re a victim of fraud you should also tell your insurance company and the IFB. Of course, there’s nothing better than prevention and you should always try and avoid drivers acting erratically. Leave plenty of space behind the car in front or just pull over and wait if you’re really concerned. ‘Crash for cash’ scenarios could happen anywhere so it pays to be wary of any car being driven suspiciously. According to the research it’s Birmingham where you’re most likely to be a victim of this kind of scam. 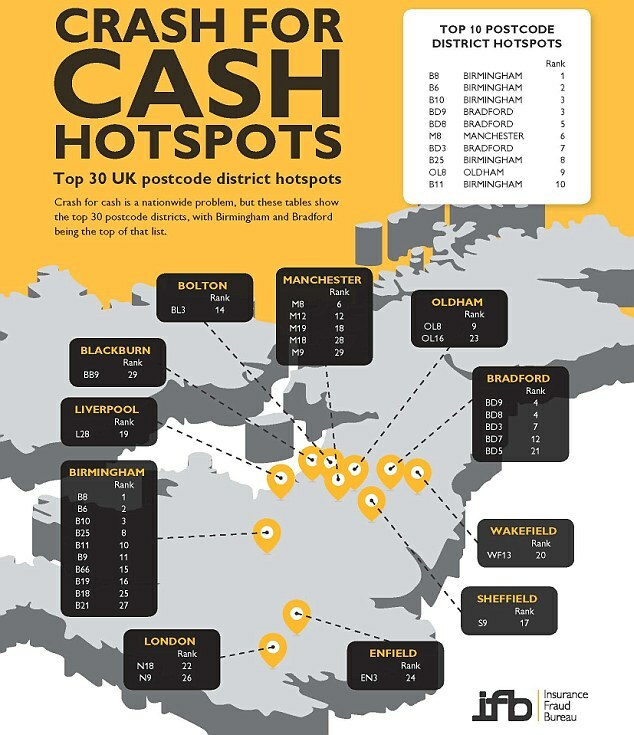 Five of the postcodes featuring in the top 10 were in the city. Drivers in Bradford should also be on their guard – the city took three of the places in the top 10. Finally, drivers in Manchester and Oldham should also be careful as they were highlighted as hotspots.